Practice Linear Integrated Circuits questions and answers for interviews, campus placements, online tests, aptitude tests, quizzes and competitive exams. This set of Linear Integrated Circuit Multiple Choice Questions & Answers (MCQs) focuses on “Clippers and Clampers”. 1. Which circuit is used for obtaining desired output waveform in operational amplifier? Explanation: In an op-amp clipper circuits a rectifier diode is used to clip off certain portions of the input signal to obtain a designed output waveform. Explanation: The clipping level is determined by the reference voltage which should be less than the input voltage range of an op-amp. Explanation:In a positive clipper, the diode conducts until Vin = Vref (during the positive half cycle of the input), because when Vin < Vref, the voltage (Vref) at the negative input is higher than that at the positive input. 4. What happens if the potentiometer Rp is connected to negative supply? Explanation: If the potentiometer Rp is connected to negative supply -VEE instead of +VCC, the reference voltage Vref will be negative. As a result the entire output waveform above -Vref to be clipped off. Explanation: The negative portion of the output voltage below -Vref is clipped off because, diode will be in off condition when Vin < Vref. 6. What happens if the input voltage is higher than reference voltage in a positive clipper? Explanation: When input voltage is higher than reference voltage, the op-amp operates in open loop and diode become reverse biased. Thus, the output voltage will be equal to reference voltage. Explanation: A positive small signal halfwave rectifier can rectify signals with peak values down to few millivolts, because the high open loop gain of the op-amp automatically adjusts the voltage drive to the diode, so that the rectified output peak is the same as the input. 8. Determine the output waveform of negative small signal half wave rectifier. Explanation: During the positive alteration of Vin, D1 is reverse biased. Therefore, Vo =0v. On the other hand, during the negative alteration, D1 is forward biased and hence Vo follows Vin. Explanation: The diode acts as an ideal diode, since the voltage across the ON diode is divided by the open loop gain of the op-amp. As the input voltage starts increasing in the positive direction, the output of the op-amp also increases positively till the diode become forward biased. 10. 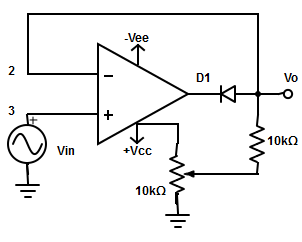 How to minimize the response time and increase the operating frequency range of the op-amp? Explanation: Negative halfwave rectifier circuit with two diodes are used so that the output of the op-amp does not saturate. Thus, minimizes the response time and increases the operating frequency range. 11. Why a voltage follower stage is connected at the output of the negative small signal half wave rectifier? Explanation: The output resistance of the circuit is non-uniform as it depends on the state of diode. That is, the output impedance is low when diode is on and high when diode is off. Explanation: A clamper clamps the output to a desired dc level. 13. Determine the output waveform for a peak amplifier with input =4Vpsinewave and Vref=1V. 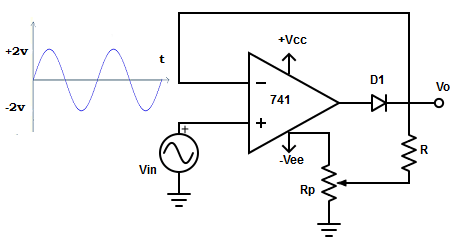 Explanation: In a peak amplifier the input waveform peak is clamped at Vref. The output voltage Vo=2Vp+Vref=(2×4v)+1v = 9v. Explanation: In an op-amp clamper circuit, a pre-determined dc level is deliberately inserted at the output voltage. For this reason, the clamper is sometimes called as DC inserter. 15. At what values of Ci and Rd a precision clamping can obtained in peak clamper when the time period of the input waveform is 0.4s? Explanation: For precision clamping, Ci and Rd << T/2. So, (0.1µF×10 kΩ) << (0.4/2) = 1×10-3 << 0.2. Therefore, Ci=0.1µF and Rd=10kΩ. 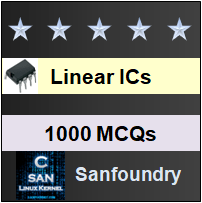 Sanfoundry Global Education & Learning Series – Linear Integrated Circuits. To practice all areas of Linear Integrated Circuits, here is complete set of 1000+ Multiple Choice Questions and Answers.